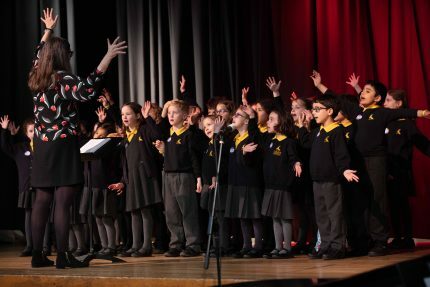 Young choristers from local prep and state primary schools took part in the third annual Colfe’s Junior Choir Festival for Key Stage 1 pupils this week. Colfe’s Senior School Choir opened the festival with Sit Down You’re Rocking The Boat from Guys and Dolls and the audience were encouraged to join in with rhythmic finger clicking. All five school choirs excitedly performed their warm up songs Warm Up The Brain and Warm Up Stomp. The visiting schools were Blackheath Preparatory School, Deansfield Primary School, The Pointer School and Brindishe Manor. Each school sang beautifully with enthusiasm and gusto and the afternoon ended with all choirs singing a prepared song, accompanied by special guest Joe Thompson, pianist and Musical Director at The Ivy. Sing a global melody and let the world rejoice. Joe was complimentary and encouraging about all the choirs telling the children not to forget that “music is the closest thing to magic and grown-ups sometimes forget this!” He complimented the choirs on their confidence, their choice of contrasting songs and their evocative and rhythmic performances. Joe then asked two brave children to stand up and lead the audience in the African medley call and response song as performed earlier by the Brindishe Manor School.